Sturdi Products :: Exhibitor Set-Up :: Fleece Hammock - for Pop-Up Kennels :: Sturdi - Fleece Hammock - for Pop-Up Kennels Small, 1 Pcs. Home/Sturdi Products/Exhibitor Set-Up/Fleece Hammock - for Pop-Up Kennels/Sturdi - Fleece Hammock - for Pop-Up Kennels Small, 1 Pcs. Sturdi - Fleece Hammock - for Pop-Up Kennels Small, 1 Pcs. The Fleece Comfort Hammock for your Pop-Up Kennel adds maximum comfort. Covered with soft fleece, this light weight Comfort Pad is filled with a cushy, convoluted or "egg-crate" style foam that provides air circulation and superior weight distribution for support, comfort and pressure relief. 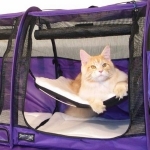 The Comfort Pad may be beneficial for aging pets and/or pets with arthritic or other orthopedic problems. Washable.